Crime is a major problem in many areas, particularly densely populated areas. As much as we may wish for peaceful, crime-free lives, this is most likely not going to happen anytime soon. Punishing criminals or preventing them from committing crimes in the first place is typically necessary for protecting ordinary citizens from crime. Forensic psychology often plays a role in punishing and preventing crimes. The word forensic is defined as "the scientific method for investigation of crime". Forensic psychology is often described as the merger of law and psychology. This field of psychology is often focused on the criminals themselves. Professionals in this field are often given the ominous responsibilities of trying to figure out why certain types of people commit crimes; what type of person committed a crime; and how to prevent people from committing crimes. Before 1940, psychologists weren't revered as expert witnesses in a courtroom and medical doctors were preferred. In 1940, however, the court case People v. Hawthorne ruled that an expert witness's title was less important than the breadth of his knowledge. Another court case in 1962, Jenkins v. United States, ruled that psychologists were acceptable expert witnesses in a courtroom. Why Do We Need Forensic Psychology? Forensic psychology can sometimes be a very important piece of the puzzle when trying to solve a criminal case. Professionals in this field are often able to help narrow down the suspect list or at least provide a motive for a crime. In some cases, the expert testimony of a respected forensic psychologist might be the last piece of the puzzle when trying to convict a criminal. The field of forensic psychology is also a very important part of crime prevention as well. Professionals in this field might be called upon to participate in the rehabilitation of criminals, for instance, to help ensure that they become law abiding citizens. Research in this field can also help pinpoint certain types of people who might possibly commit crimes before they actually do. What Are the Education Requirements to Become a Forensic Psychologist? In general, individuals pursuing forensic psychology careers should make sure that their education is focused on psychology, criminology, and forensics. There are a couple different ways to pursue this type of education. First, a student can earn a bachelor's degree in psychology with a focus on criminology or criminal justice. A student can also earn a bachelor's degree in criminal justice or criminology with a focus on psychology. Some courses that an aspiring forensic psychologist might take may include courses on forensics, abnormal psychology, and the psychology of deviance. A bachelor's degree, however, is often not enough to pursue a forensic psychology career. Master's degrees and doctorate degrees in forensic psychology are usually necessary. Learn more about forensic psychology degrees. Research is often a big part of a forensic psychology career. Forensic psychologists will often study and analyze research from other professionals, as well as conduct their own research. They might study criminals and their crimes, for instance, to determine what traits certain types of criminals have. These tasks may involve interviewing criminals, along with their loved ones and victims. 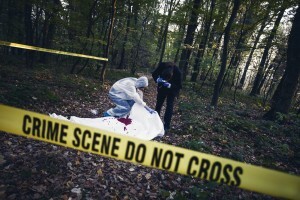 A forensic psychologist will also often study crime scenes. Evidence, or even the lack of evidence, at a crime scene can often be used to develop a criminal profile. This can then be used to narrow down a list of suspects. Many forensic psychologists also act as expert witnesses during criminal trials. They will often give testimonies about why a crime may have occurred, or whether or not they believe a defendant was likely to have committed the crimes in question. A forensic psychologist might also have an influence on a criminal's sentencing. Where Does a Forensic Psychologist Work? Those pursuing forensic psychology careers will often be able to find employment in police stations, courthouses, and law firms. Prisons, jails, and juvenile detention centers also hire forensic psychologists. Individuals pursuing forensic psychology careers might also have opportunities to be self-employed. Some may work as consultants, for instance, or they may choose to receive compensation for testifying as expert witnesses. What Is the Median Salary of a Forensic Psychologist? The BLS does not publish salary data specifically on forensic psychologists, however, the closest related profession-a traditional psychologist- was reported to be $86,510 in 2010. PayScale.com lists the salary range of forensic psychologists as $35,333 to $103,576. Salaries vary widely based on the metro where employment is found. William Marston discovered a correlation between blood pressure and lying in 1922, which would later become the basis for the polygraph machine, or lie detector test. In 1923, he testified in Frye v. United States, which was a court case that set the precedent for allowing expert testimony during a court case. What is a BA in Psychology?